Join us for this one-off screening where we are thrilled to welcome Duglas T Stewart (BMX Bandits) for a post-show Q&A with Graeme Ogston of Spare Snare. Directed by Grant McPhee (Big Gold Dream) and with a voiceover by Kim Deal of Pixies and The Breeders, Teenage Superstars tells the story of the West Coast of Scotland’s indie scene in the 1980s and ‘90s. Using archive footage as well as contemporary interviews to acquaint us with the key figures of the scene at the time, this is a film which lovingly examines the microcosm in which Scottish music flourished and the lasting global influence it has had. 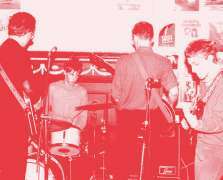 From Glasgow club nights organised by Bobby Gillespie to bands using their gran’s front room as a practice space, we see the lo-fi starting points for such vital and influential bands as Primal Scream, The Jesus and Mary Chain and The Vaselines. There is also a detour to the unlikely musical mecca of Bellshill where we witness the birth and rise of BMX Bandits, Teenage Fanclub and The Soup Dragons. Figures such as Stephen Pastel of The Pastels and Alan McGee of Creation Records prove excellent and generous company as they recount honestly these times in their lives, all with a combination of confident self-belief and a certain incredulity that any of it actually happened in the first place. As the film progresses through to the 1990s and bands break up or change line-ups, McPhee never loses sight of the fact that it was a passion for music which brought so many people together in the first place and that this is something to be celebrated.